Following in my own footsteps / Mace Francis. Instrumentation: This is an alto sax (reed 2) solo feature composed for a reduced big band line up of: 4 saxophones (soprano, alto, tenor, baritone), 3 trumpets, 3 trombones, guitar, bass, drum kit. A standard big band version is also available on request. This composition makes up part of the album, Music For Average Photography, which won the 2015 APRA/AMCOS Art Music Award for Jazz Work of the Year. 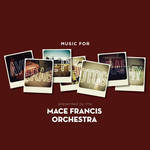 CD: Music for average photography / presented by the Mace Francis Orchestra.